“There are two ways of approaching God in Nature. One is to separate the Lord from all His manifestations. ‘Neti, neti,’ is the saying in India: ‘Not this, not that.’ Something of that consciousness there must always be, lest one become trapped in attachment to form. “The other way is to behold the Lord manifested everywhere. “The first way, by itself, may be too austere for most devotees. The second way is much sweeter. Best of all is a combination of both. The Master smiled at this encounter between scientific materialism and traditional piety. “And yet,” he commented, “your grandmother is not so superstitious as she seems. For with the flower she is expressing her gratitude to God. It isn’t that she views the radio as a deity. She is simply seeking an external focus for her devotion. “And isn’t it good to see God enshrined everywhere? We think of the radio as man-made, but from Whom came the intelligence that made the radio? From Whom came even the materials from which it was created? 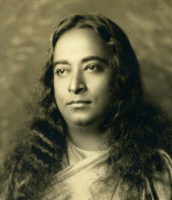 This entry was posted in cosmic mother, divine mother, yogananda. Bookmark the permalink.